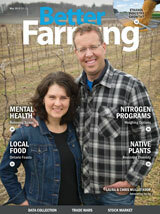 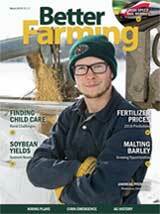 Better Farming March 2018 edition features Andrea Pfenning on the cover, and the following articles: Finding Child Care - Rural Challenges, Soybean Yields - Nutrient Needs, Fertilizer Prices - 2018 Predictions, Malting Barley - Growing Opportunities, and High-Speed Rail Worries. 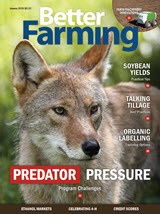 Better Farming January 2018 edition features the following articles: Predator Pressure - Program Challenges, Soybean Yields - Practical Tips, Talking Tillage - Best Practices & Organic Labelling - Exploring Options. 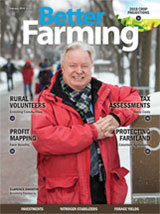 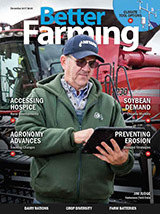 Better Farming December 2017 edition features Jim Judge on the front cover and the following articles: Accessing Hospice - Rural Developments, Soybean Demand - Chinese Markets, Agronomy Advances - Tracking Changes, & Preventing Erosion - Blended Strategies.